← Sunday 31st August 2014 – Back to the training for my Shine Walk. Monday 1st September 2014 – Last few days of freedom. The summer holidays are very nearly over. George is back on Wednesday and Emily on the Thursday, so today I promised them that we would go out for a fun afternoon. I didn’t want to drive that far, and the weather was a bit drizzly at times, so we headed off to Claremont Landscape Gardens. It’s only about a 20 minute drive away, and no need to go on the M25 at any point, so it’s even better. We arrived about 2.30pm and had a leisurely wander round. Loads of the geese and ducks, that are usually in the pond, were out on the grass, and it looked a bit like a scene from the birds as they watched you as you walked past. 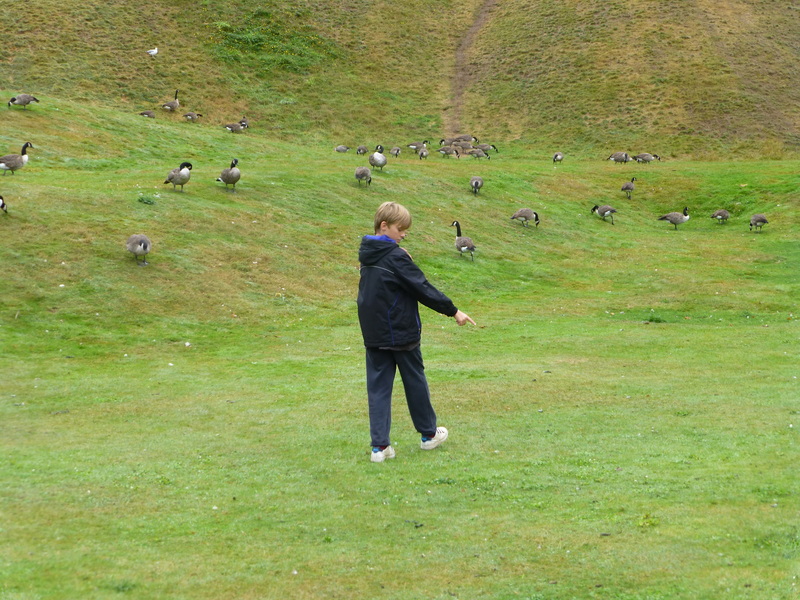 George decided that he would try and herd some of them like sheep, but they weren’t impressed and kept quacking at him. George trying to herd the geese. We walked round and round various paths, just taking a gentle stroll. The drizzle had stopped, but every time the trees moved, then water fell on us, so there was to be no sitting under a tree for a rest. 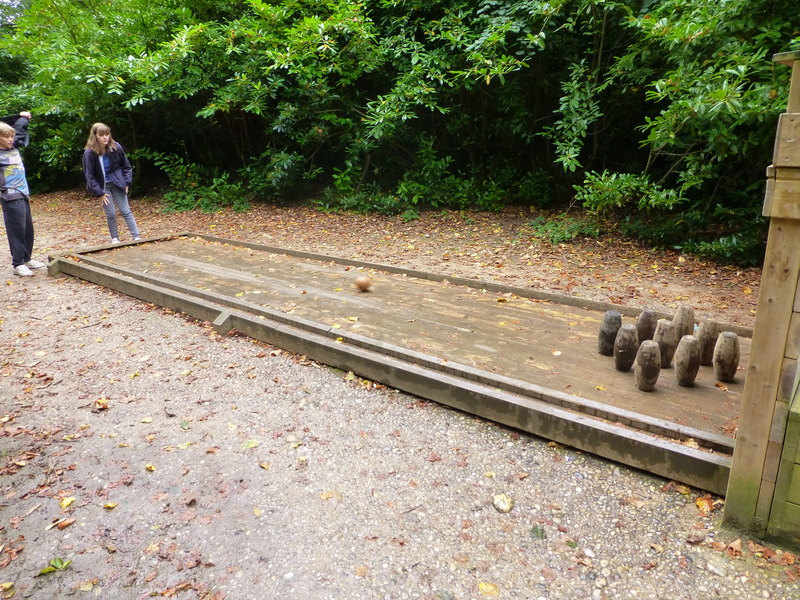 They have an outdoor bowling game, and we all had a go, but the ball was rather dirty, so you didn’t want to hold it for that long. Emily bowling, she did very well. 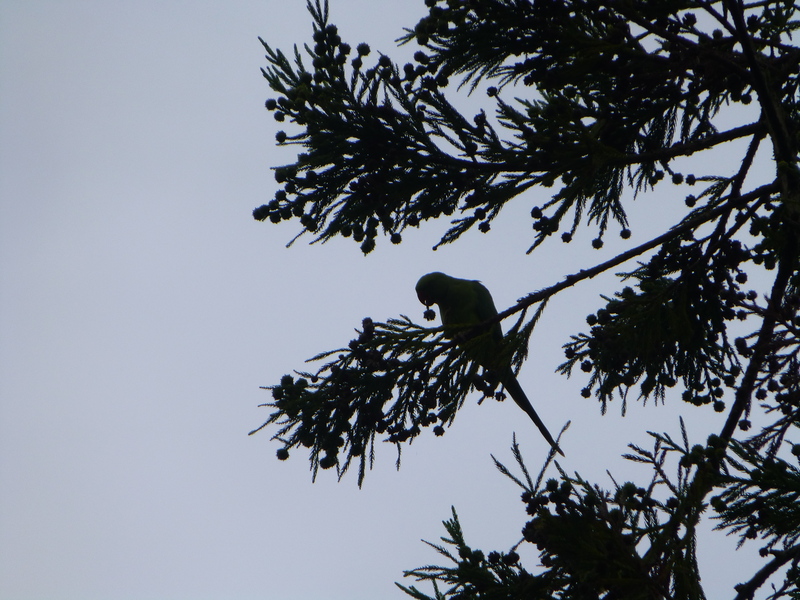 As we wandered further we saw dozens of parakeets flying over head. They were flying from tree to tree, eating the fir cones. They had wonderful grass green breasts, and they were easy to hear as they screeched so load!! Fir cone for tea anyone? In the lake there were loads of fish swimming and a Heron was keeping guard. We didn’t see him fish for any, so maybe he wasn’t hungry at the time. But as we came to the end there is a play area for children 11 years and under. 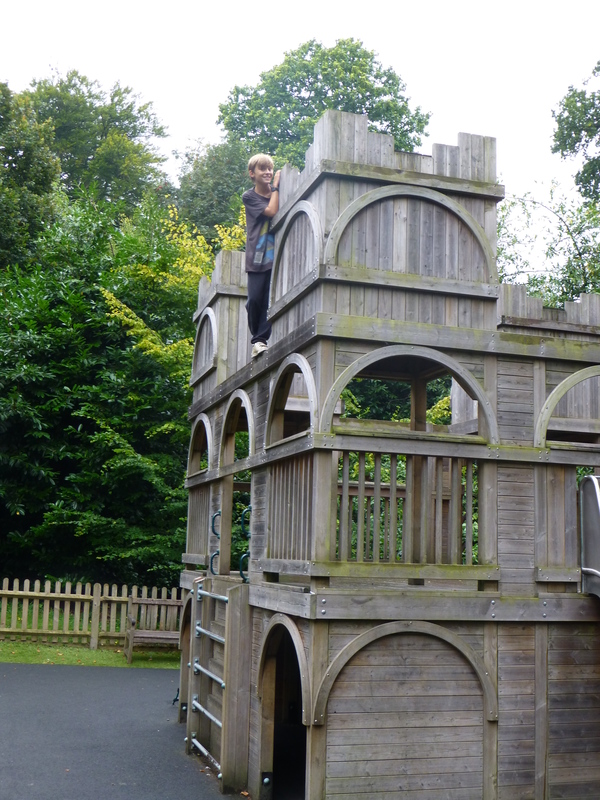 Now George is 12, but as there were hardly any baby children playing in the play area, I figured that it would be ok for him to have a go. Emily and I sat on some benches that were undercover and bet on how long it would take George to climb to the very top of the castle. Not long as it happened, I think it was the first thing he did. He was then joined shortly after by 2 other girls about his age, and they sat on a section each for ages and chatted. On the way down, one of the girls got stuck and then hurt her leg a bit (nothing but a bruise) George sat with her and chatted, til her granny came along (who we were actually sitting next to on the benches). I was told how wonderful George had been on talking to her to keep her happy. That’s my boy. We’re sure he was a monkey in a previous life. Then just before we went home, I got the kids and ice cream, and I had a tea (far too cold for me to have something frozen). Then we drove home, but as it was a short journey no one fell asleep. A great end to hopefully what has been a great summer break for the kids….Now get back to school!! This entry was posted in Uncategorized and tagged claire's allotment, Claremont Landscape Gardens, National Trust, parakeets. Bookmark the permalink.